When we went to Los Angeles a short while ago my son, the actor, wanted to take us to a live performance of “Real Time with Bill Maher”. I used to love Maher’s work but when he came to Santa Fe for a live show we were rather disappointed. Hunter, however, had gone to great lengths for us: when there was no response to his application for tickets he found the person in charge of seating and got us, not only seats, but a parking space in the CBS Studio lot where Real Time originates-- so that was where we were going. Unfortunately, no photographic evidence that we were there because they took our phones away as we walked into the building! I found that a show that did not seem exciting on the tube was quite different in real life. We got in a bit early and I asked to use the facilities and found I had to be escorted. It made sense when I realized we were back stage where who knows what havoc could be caused, not to mention that I would have needed a road map and thrown breadcrumbs to find my way back to my seat! The chief writer came on stage to warm up the audience. Basically he told us the format of the show, trying to make some lame jokes in between. Then he showed us a video of clips from some of Maher’s previous shows. Everyone enjoyed it and laughed a lot, getting in the mood. Finally, Maher himself came out to do a monologue, up close and personal. All the while there were three cameras in place on the right, left and center of the stage and one camera on a boom that went back and forth from one side to the other, sometimes pointing towards the audience. The director must have nerves of steel to get it right selecting the best image to broadcast. One does realize rather quickly, however, that although the show is televised live, there is a tight format and everything has been rehearsed to some degree. All the guests know the topics that will be discussed, even if not exactly what will be said. After Maher’s stand up routine, he will sit down with his guest star. Then a desk will slide up to the front of the stage with his panel and he adds another guest before the panel disburses. 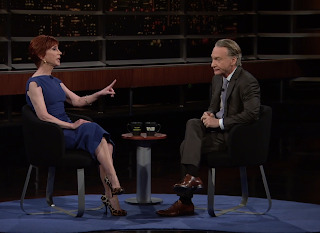 After that comes his “New Rules” and a final commentary.On the show we attended comedian Kathy Griffin was Maher’s special guest. Comedians always have to push the borders of good taste, sometimes too far and must pull back. If you remember that is how we lost Senator Al Franken, mostly because of an obviously staged photo of Franken putting his hands on a woman’s breasts. Kathy Griffin pushed even further when she posted a photo of herself holding a fake severed head resembling Donald Trump. As much as I understand the sentiment I have to agree, that goes too far. 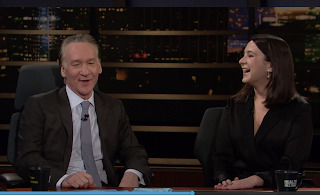 It seems, however, that the current administration reacted in a similar extreme and Bill Maher was the only one who was willing to defend her publicly. Rather than reading about that interview where she talks about how she was virtually black balled, McCarthy style, by Jeff Sessions and put on a no fly list even with Interpol, so she would be detained and questioned in airports internationally, listen for yourselves. The entire interview is about 10 minutes long. The panel included Erick Erickson, an Evangelical conservative blogger and radio host in Atlanta; Ana Navarro, Nicaraguan-born Republican Strategist with various news outlets including CNN, ABC and Telemundo; Trae Crowder, a comedian; and, near the end of the panel discussion; Bari Weiss from the NY Times adding some additional gravitas. 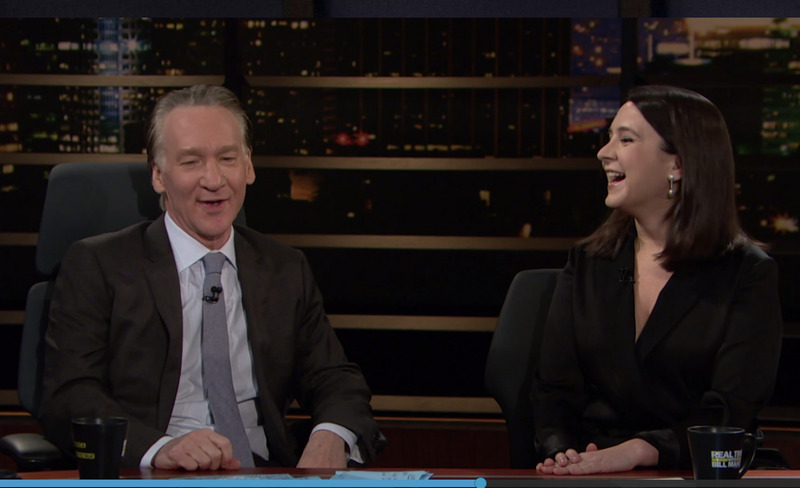 It is a little like a great dinner party where the host, Bill Maher, leads the conversation and is a major contributor so that the result is a serious but amusing conversation among friends. I was about to say it was the usual liberal view one hears except Erick Erickson was far from right wing extremist nor was Bill Maher overly liberal. There was a real balance of opinion, making for an enjoyable show and leaving one with something to think about. 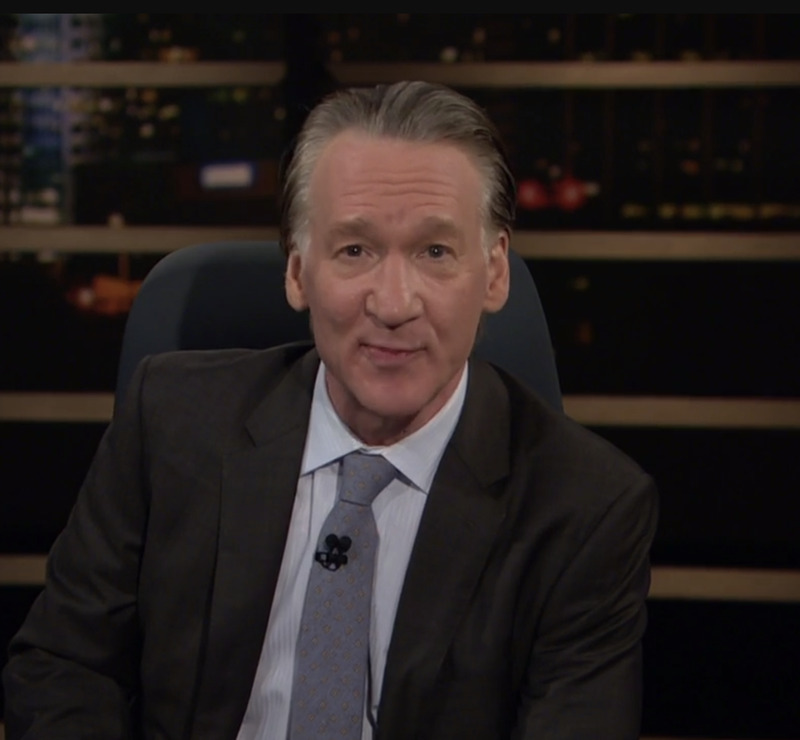 Maher closes with his sometimes insightful, sometimes silly, “New Rules” and a commentary. The one we heard was about the Second Amendment being an amendment not a commandment! I found the evening a fascinating choreographed experience, which I was happy to be part of, as, clearly, was the rest of his audience.